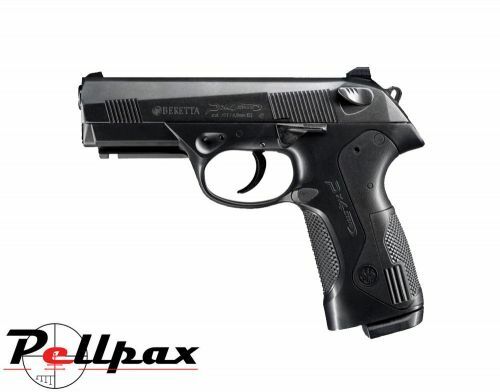 The PX4 Storm looks, feels and shoots just like the firearm it copies! This 16-shot repeater will have you shooting as fast as you can pull the trigger. There's an 8-shot rotary clip on one end of the stick mag, and another one at the other end. After you're done shooting the first clip, flip the mag for the rest of the shots! Since it shoots BBs or pellets, you can pick whatever ammo you have on hand. A 12-gram CO2 cartridge is easily loaded into the grip and gives you plenty of shots before you need a refill. There's even an accessory rail under the barrel. Like the handgun, it has real blowback action (cocking the gun with each slide action), giving you a feeling of power that most airguns only hope to achieve! Once you start shooting, you won't want to stop, so get lots of ammo and CO2 cartridges! A misprint in the manual says there's an operational slide release lever. There is none.